ST. LOUIS (AP) Five days after his first child was born, St. Louis Blues defenseman Carl Gunnarsson left the rink with a special present for his daughter. ”I’ve got the puck,” Gunnarsson said after scoring the game-winning goal Monday night in a 4-2 victory over the Los Angeles Kings. 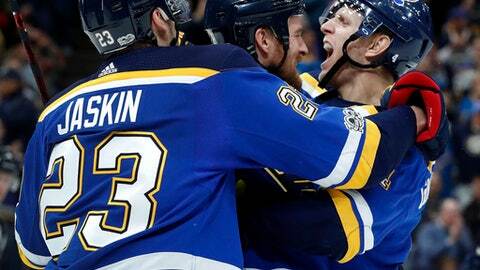 Vladimir Tarasenko and Jaden Schwartz each had a goal and an assist to lead the Blues in a matchup between two of the NHL’s top squads. Vladimir Sobotka added an empty-netter for the Blues, who improved to 10-2-1 to match the franchise’s best start set in 1997. Jake Allen made 26 saves as St. Louis remained the only unbeaten team on home ice this season (5-0). Tanner Pearson and Dustin Brown scored for the Kings, who had their three-game winning streak snapped and fell to 9-2-1. Jonathan Quick made 26 saves. ”It was kind of a scramble puck and just cut to the inside and I saw (Tarasenko). He had a little speed, a little step on the guy, and a great shot by him,” Schwartz said. Three minutes later, Schwartz cleaned up the rebound of Brayden Schenn’s shot to make it 2-0. Allen robbed Pearson with a glove save after Pearson found himself alone in front with 7:52 left in the second. Gunnarsson made up for the defensive lapse with his third goal of the season with 3:41 left in the second. The Kings unsuccessfully challenged the goal, claiming Kyle Brodziak interfered with Quick. Gunnarsson’s goal, his fourth, was the 14th by a Blues defenseman this season, tops in the NHL. NOTES: Doughty played in his 700th career game. … Schenn was selected by the Kings with the fifth pick in the 2009 draft. … The Kings scratched D Oscar Fantenberg and C Nick Shore. … The Blues scratched RW Chris Thorburn, D Nate Prosser and G Ville Husso. Kings: Host the Toronto Maple Leafs on Thursday. Blues: Host the Philadelphia Flyers on Thursday.